A favorite of resorts and country homes for generations, the Adirondack chair is perennially popular with our customers. Its wide arms, comfy, sloping backrest and seat and classic design just seem to invite you to sit down and relax. 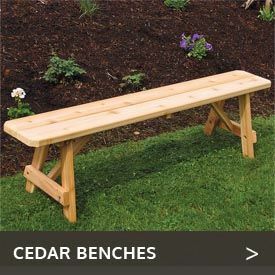 At Cedarwood Furniture, we carry a large selection of Western red cedar wood Adirondack chairs that will provide you, your family and guests years of enjoyment and relaxation. Carefully crafted in the U.S., these chairs will shrug off the weather and insects, thanks to cedar’s naturally protective oils. 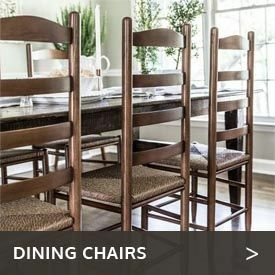 We carry cedar Adirondack chairs in many designs and sizes, allowing you to suit your decorative scheme and to seat anyone in comfort, from kids to the biggest folks. You can order elegantly simple Adirondack chairs as well as chairs with fun designs, like wine glasses or hearts. 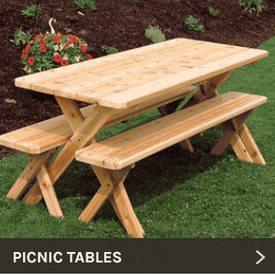 For added comfort and convenience, don’t forget to check out our cedar Adirondack chair sets and collections. These sets team up our wonderful Adirondack chairs along with matching cedar pieces such as footrests and side tables.